Buying and selling a home in Aylesbury isn’t the easiest or cheapest thing you will ever do. Estate Agent fees, Solicitors fees, Survey fees, Mortgage fees, Removal Van … the costs just mount up throughout every step of the move. Last week, an Aylesbury landlord asked me whether the Council Tax Band made a difference to a property’s appeal, be it tenanted or to owner occupiers, when it comes to being sold on the open market and whether extensions or improvements made a difference to the tax banding? Well, like I said, the first point you should always be aware of is what Council Tax Band your new house or apartment will fall under. Being aware of this before you buy/move will help when planning, month by month, for life in your home (or investment). But what exactly are Council Tax Bands, and how do they affect landlords/tenants/homebuyers? 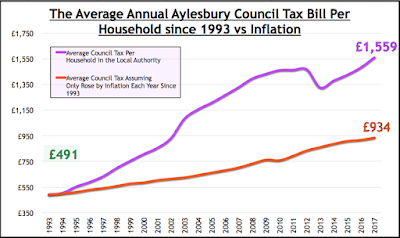 Interestingly, the average current level of Council tax paid by Aylesbury people stands at £1,559 per annum; up from £491 in 1993 (although if it had risen by inflation in those 25 years.. today that should only be £934) … meaning Council Tax has outstripped inflation by 67.02%. So unless the local authority changes its majority political party, the only way you can change the amount you pay in Council Tax is your banding i.e. you physically move to a higher or lower band. In terms of which band the property is in, this can be challenged. In my experience in the Aylesbury property market the only issue is one where there is an anomaly with the banding, when one property is in a different band to all the others in the street. This is much rarer than it used to be, as most such anomalies have been found and rectified. Anyone can check the banding of any property by going to Google and typing in “Check My Council Tax Banding”. I do need to mention a thoughtful warning though. Challenging your Council Tax Band is not something to do on a whim for one simple fact - you cannot request your band to be lowered, only 'reassessed', which means your band could be moved up as well as down. I have even heard of neighbouring properties band’s being increased by someone appealing, although this is the exception. The degree to which young Aylesbury people are locked out of the Aylesbury housing market has been revealed in new statistics. An Aylesbury landlord was asking me the other week to what effect homeownership rates in Aylesbury in the early to middle aged adult age range had affected the demand for rental property in Aylesbury since the Millennium. I knew anecdotally that it affected the Aylesbury rental market, but I wanted some cold hard numbers to back it up. As you know, I like a challenge when it comes to the stats.. so this is what I found out for the landlord, and I’d like to share them with you as well. 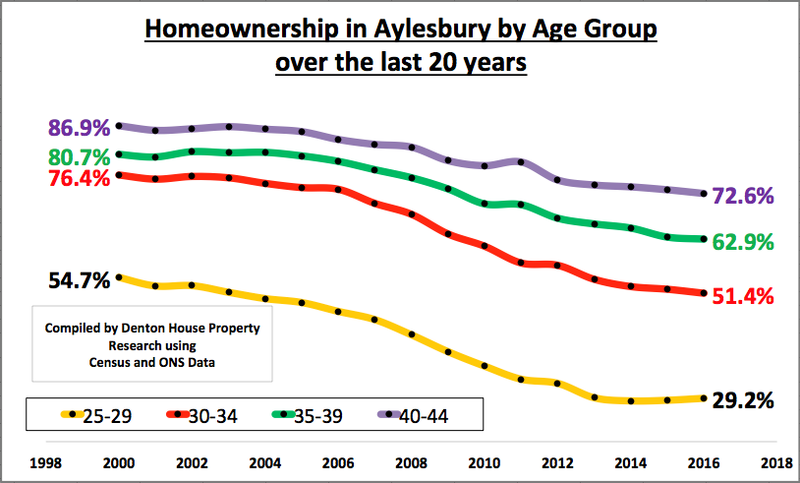 As anyone in Aylesbury, and most would say those born more recently, are drastically less likely to own their own home at a given age than those born a decade earlier, let’s roll the clock back to the Millennium and compare the figures from then to today. In the year 2000, 54.7% of Aylesbury 28-year olds (born in 1972) owned their own home, whilst a 28 year old today born in 1990) would have a 29.2% chance of owning their own home. Next, let’s look at someone born ten years before that. 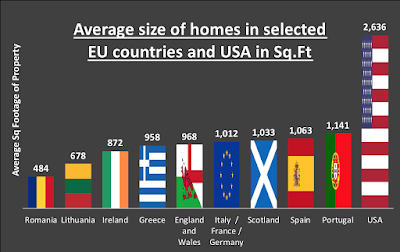 So, going back to the Millennium, a 38 year Aylesbury person (therefore born in 1962) would have an 80.7% chance of owning his or her own home and a 38 year old today in Aylesbury (born in 1980) would only have a 62.9% chance of owning their own home. If you look at the graph below, split into the four age ranges of 25 year olds (yo) to 29yo, 30yo to 34yo, 35yo to 39yo and finally 40yo to 44 yo, you will quite clearly see the changes since the Millennium in Aylesbury. 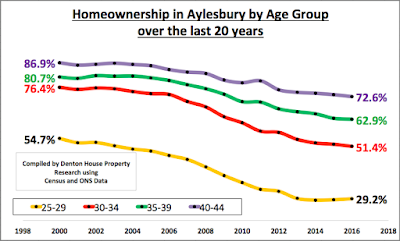 The fact is the figures in Aylesbury show the homeownership rate has proportionally fallen the most for the youngest (25yo to 29yo) age range compared to the other age ranges. The landlord suggested this deterioration in homeownership in Aylesbury across the age groups could be down to the fact that more of those born in the 1980’s and 1990’s (over those born in the 60’s and 70’) are going to University and hence entering the job market at an older age or those young adults are living with their parents longer. So, what does this mean for the rental market in Aylesbury? This property has been on the market for a while now and priced at offers over £255,000 this could be one for the BTL investor. Its a two bed terraced house, good sized bedrooms, nice garden. and allocated parking for two cars. For me its a good property to come to the rental market. We Let a similar one on Berryfields in January for £900pcm. Well given that the rental market is picking up again, and allowing time for the sale to go through, you could have this on the market to rent in the summer and should be still worth £900pcm then. So we are looking at circa 4% gross yield. not at all out of keeping with the rest of Aylesbury. And there is potential for capital growth in the future. VERY interesting conversation with a landlord of ours today. He has a small portfolio of four properties the first purchased about 10 years ago. Some of them have been remortgaged to finance deposits for further purchases but he has not looked at the mortgages on each of them for a few years. Why would you when rates have been so low? 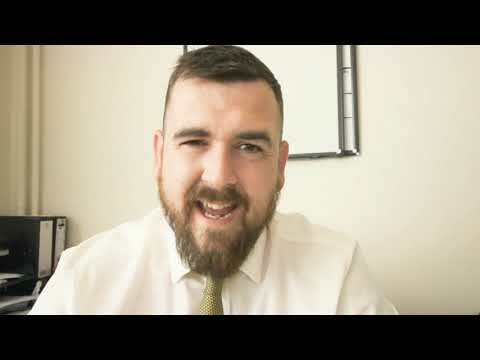 He has just this week sat down with his broker to remortgage the portfolio because he like most of us he wants to ensure his portfolio is as income effective as it can be in the future. We are likely to see further interest rate rises and he wanted to protect himself from those increases. Income is going to be eroded by tax changes and other costs he can do little about so he wanted to make sure he was being as sensible as possible regarding the mortgage packages. He was stunned to find that he can fix the rate for 5 years on each of his properties at a LOWER rate than he is currently paying!! Yes that’s right...he can actually reduce his monthly costs AND protect himself from any rate rises for FIVE years. With the almost complete lack of new entrants to the Buy to Let market lenders are desperate to lend to existing landlords by way of remortgage. The rates they are offering are super competitive. Many have few if any costs with many offering free survey and conveyancing, some even offer a cashback in addition! If you have not looked at fixing your mortgages you really should be talking to your broker or at the very least be browsing the internet to look at rates NOW. You may find that you, like this landlord can get a stunning result for little cost. If you want to talk through your investment plans and strategies as always I would be delighted to help you. 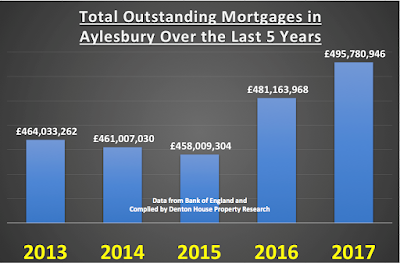 A little bit of good news this week on the Aylesbury Property Market as recently released data shows that the number of first time buyers taking out their first mortgage in 2017 increased more than in any other year since the global financial crisis in 2009. The data shows there were 527 first time buyers in Aylesbury, the largest number since 2006. 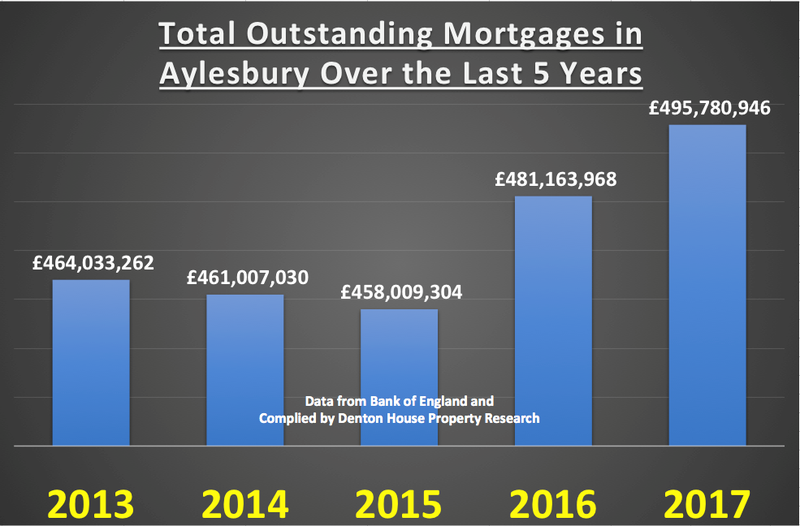 Interestingly, looking at the other end of the market, the buy-to-let investment in Aylesbury was subdued, with only 108 buy-to-let properties being purchased with a mortgage. However, I must stress, whilst there is no hard and fast data on the total numbers of landlords buying buy-to-let, as HM Treasury believes only 30% to 40% of buy-to-let property is bought with a mortgage. This means there would have been further cash only buy-to-let purchases in Aylesbury – it’s just that the data isn’t available at such a granular level. In terms of the level of mortgage debt in Aylesbury, looking specifically at the HP19 to HP21 postcodes, you can see from the graph there has been a steady rise in borrowing over the last couple of years. So, what does all this mean for the Aylesbury Property Market? Well, the stats paint a picture, but they don’t inform us of the whole story. The upper end of the Aylesbury property market has been weighed down by the indecision around the Brexit negotiations and rise in stamp duty in 2014, when made it considerably more expensive to buy a home costing more than £1m. The middle part of the Aylesbury property market has been affected by issues of mortgage affordability and lack of good properties to buy, as selling prices have reached the limit of what buyers can afford under existing mortgage regulations. The lower to middle Aylesbury property market was hit by tax changes for buy-to-let landlords, although this has been offset by the increase in first time buyers. If you are in the market and selling now and want to ensure you get your Aylesbury property sold, the bottom line is you have to be 100% realistic with your pricing from day one and you might not get as much as you did say a year ago (but the one you want to buy will be less – swings and roundabouts?). I know it’s not comfortable hearing that your Aylesbury home isn’t worth as much as you thought, but Aylesbury buyers are now unbelievably discerning. As our families grow bigger the need for more space, be that bedrooms or reception rooms, has grown with it. Also, as our older generation lives longer and nursing home bills continue to rise quicker than a rocket on the 5th of November (the average nursing home bill in the area being £839 per week) many families are bringing two households into one larger one. 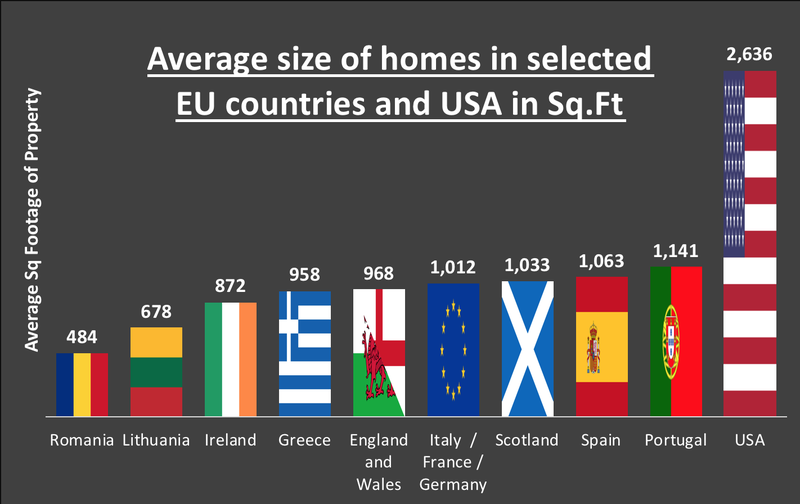 So, should you move somewhere larger, or extend your Aylesbury property to make it large enough for you and your family? In some circumstances the choice has been made for you. If you live in an apartment with no garden, there isn’t much of an opportunity of making it larger. But if you have a house with a garden or an attic with sufficient headroom, extending your home becomes a real prospect. Even if it makes more sense to extend or move, the choice hangs on a number of different dynamics – your future plans, money (both saved and access to finance), in what way you are emotionally attached to your home, the particular area of Aylesbury you live in and finally, the type/style of house you prefer. So back to the question in hand.. extending does mean you will have a lot of inconvenience whilst the work is being carried out. The location of your Aylesbury property, the quality of construction, what type of room(s) you want to add, your plot, neighbouring building lines, planning regulations and the overall demand for your type of Aylesbury home, will make a vast difference to the financial repercussions of extending versus moving. In terms of what it would cost to build an extension, you can expect to pay on average between £140 to £200 per sq.ft, depending whether the extension is a single or double storey extension and other factors including finish and type of extension (note – I have seen it cost a lot more than these figures – so please speak with a builder) … So taking a mid line figure, that same 270 sq.ft extension on your Aylesbury home would cost on average £55,080. However, moving means there are substantial costs incurred - Estate Agency fees, Removal Van, Survey Fees, Legal fees and Stamp Duty on the property you are buying. Neither option is the obvious choice and comparing the costs of extending your Aylesbury home to that of moving is not a stress-free undertaking. How realistic each option is will probably come down to one thing .. your mortgage provider. You will need a considerable sum of equity in your Aylesbury home before you can think of increasing your mortgage more, because most lenders will require you to have at least 10% to 20% equity left in your property after the extension or move has been done.